Now this really is a small thing. The weather outside has turned “frightful.” It’s cold and rainy. The temperature inside is chilly, as we try to save on our electricity bill. Socks are just not enough to keep my feet warm as I work in the kitchen or cart the laundry basket downstairs. And so, I love the new slippers I bought for myself at Costco. They are so soft, warm and cushy! My new slippers will keep my feet nice and warm this winter! Ooohh…I think I just made an addition to the Christmas wishlist. Those look so comfycozy. They look perfect. Stay warm & cozy. 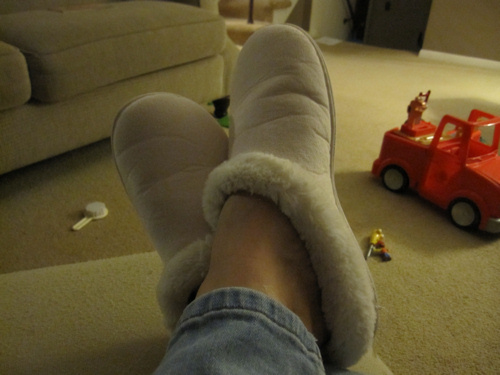 I've pulled out my slippers too…my feet are ever-cold starting this time of year! I always struggle to find the pair that are not TOO warm though! You were fast with your small thing! Love the slippers.. I just bought a new robe and LOVE it, definitely the small things when you are a mom!